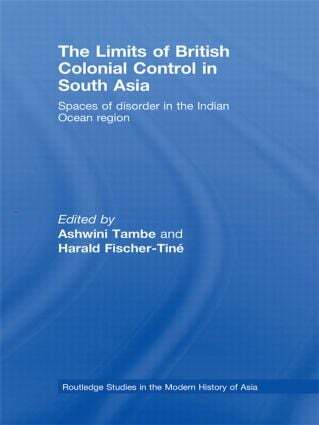 This book assesses British colonialism in South Asia in a transnational light, with the Indian Ocean region as its ambit, and with a focus on ‘subaltern’ groups and actors. It breaks new ground by combining new strands of research on colonial history. Thinking about colonialism in dynamic terms, the book focuses on the movement of people of the lower orders that imperial ventures generated. Challenging the assumed stability of colonial rule, the social spaces featured are those that threatened the racial, class and moral order instituted by British colonial states. By elaborating on the colonial state's strategies to control perceived 'disorder' and the modes of resistance and subversion that subaltern subjects used to challenge state control, a picture of British Empire as an ultimately precarious, shifting and unruly formation is presented, which is quite distinct from its self-projected image as an orderly entity. Thoroughly researched and innovative in its approach, this book will be a valuable resource for scholars of Asian, British imperial/colonial, transnational and international history.